This CEU program consists of 5 streaming videos. Presented by Christine A. Nelson, OTR, Ph.D., FAOTA. Aside from the secondary complications that can arise from a condition of low tone, there is a serious affect on development and respiration. Low postural tone can relate to conditions that range from benign to serious. This video discusses the developmental characteristics of low tone, respiration concerns, and treatment strategies for developing movement and postural control. Presented by Christine A. Nelson, OTR, Ph.D., FAOTA. This video discusses the importance of upper body function and its influence on standing and walking. Normalizing upper body control and organizing the trunk with good dissociation of the shoulder girdle and arms has dramatic impact on lower extremity function. Three children are presented with various degrees of disability. Presented by Christine A. Nelson, OTR, Ph.D., FAOTA. Preparing the child for improved upper extremity function requires organization of the trunk and postural control. Good hand use requires the ability of the arm to reach into space from a stable base of support. This video discusses the relevance of early development to the establishment of functional hand and arm use. Treatment strategies are presented for preparing the upper extremity and enhancing the functional experience of the hand and arm. Presented by Christine A. Nelson, OTR, Ph.D., FAOTA. The development of specific hand function requires opportunity and experience. This video presents approaches for facilitating organization and control of movements of the hand, stability of the arch of the hand, and refined use of the digits. The developmental hand concepts of Mary Benbow, M.S., OTR, are adapted and applied to children with neuromotor disorders. Presented by Isabelle M. Bohman, M.S., P.T. 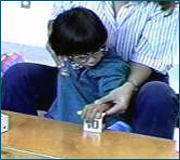 This video demonstrates the Neurodevelopmental (Bobath) Approach to the treatment of ataxia in a child who sustained bilateral cerebellar damage. Two complete treatment sessions are presented and narrated by Ms. Bohman. Special attention is given to techniques that facilitate central stability. ,br>There are no Handouts included for this course. 1. List the developmental characteristics that need normal tonus. 2. List the developmental interferences of low tone. 3. Describe how the upper body contributes to the ability to establish functional gait. 4. Describe the components of movement necessary for hand function preparation. 5. Describe the basic components of specific hand function. 6. Describe the basic problems in motor control involved in ataxia.